The UK storage market is booming and now, thanks to the exclusive StoreStack brand – only available through the EVO Group – resellers can capitalise on this growth by selling a wide range of plastic storage solutions. “At VOW we grow if resellers grow, which is why we’re continually looking to introduce new product ranges that match customer demand. The UK storage market is worth at least £54m according to the latest figures we have – and that figure is growing – which is why it made sense to introduce the StoreStack brand. Rather than marketing solely based on volume or actual sizes, which can be confusing to consumers, VOW sells the range based on what they can be used to store. 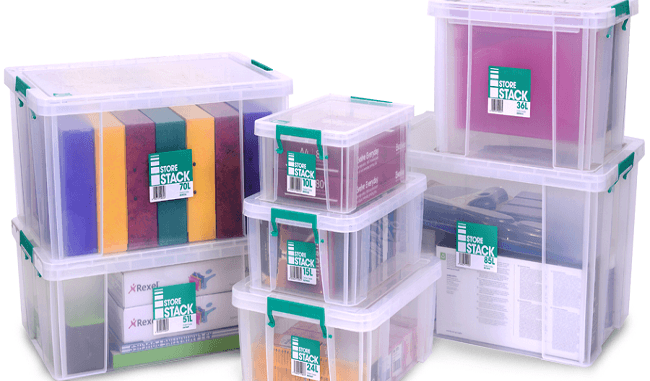 For example, a quick look at the StoreStack website – www.storestack.co.uk – shows that there are boxes designed to hold a single ream of A4 paper, A4 suspension files, five box files, IT equipment and CDs. The list of suitable uses is extensive, given there are over 20 different sizes and the range is constantly being added to. As with all of the exclusive brand products available from EVO, StoreStack provides an opportunity for resellers to sell new lines and avoid being drawn into a pricing game. This, of course, alleviates the problem of margins being squeezed.